Emily Ratajkowski struts her way back to her car after picking up some groceries on Tuesday afternoon (April 23) in Los Angeles. The 27-year-old model and actress showed off her super toned midriff in a red crop top and matching biker shorts along with white sneakers as she stepped out for the day to run a few errands. Last week, Emily stepped out with her parents and pal The Fat Jew to grab a quick bite to eat in LA. FYI: Emily is wearing Nike Cortez sneakers. Ben Affleck has signed on for World War II flick Ghost Army. The 46-year-old actor will star in and direct the film, based on the documentary of the same name as well as Rick Beyer and Elizabeth Sayles‘ book, The Ghost Army of World War II. The documentary tells the true story of a squadron comprised of former art school students and creatives who are assigned the task of fooling the Nazis into thinking the U.S. had more troops than they actually did. The film is still in development and Ben is expected to rework the screenplay. Dakota Johnson and Gwyneth Paltrow teamed up for a close friend’s birthday! Fashion editor Derek Blasberg took to Instagram to share a few photos from his birthday party on Monday night (April 22) as he cozied up with the 46-year-old Avengers actress and the 29-year-old Suspiria actress. Dakota has been dating Gwyneth‘s ex-husband Chris Martin since October 2017. Gwyneth‘s new husband Brad Falchuk was also at the party. “Consciously throupling,” Derek teasingly captioned photos. Since the Gwyneth and Chris “consciously uncoupled” back in 2014, the two have remained close as they co-parent their kids Apple, 14, and Moses, 12. Dakota and Chris even joined Gwyneth and the kids for Thanksgiving this past year. Kristen Stewart and Sara Dinkin put their toned torsos on display! The 29-year-old Personal Shopper actress and the stylist were spotted chatting while out and about on Monday (April 22) in Los Angeles. Kristen wore a gray Everlast “Boxing” sweatshirt with black and white leggings, white socks and sneakers, and round sunglasses, carrying a bottled water. Sara donned a black sports bra with black pants and black and white sneakers, along with a Gucci crossbody fanny pack and pink-rimmed sunglasses. Kristen took off her sweatshirt to stay cool as they got in the car, revealing a gray crop t-shirt. Over the weekend, Kristen and Emma Roberts did a little dance on the street together after dinner with their significant others. Don’t miss Kristen in the upcoming Charlie’s Angels reboot on November 15! Jared Leto throws up the peace sign as he arrives at the Chiltern Firehouse on Tuesday night (April 23) in London, England. 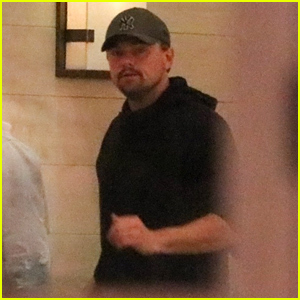 The 47-year-old Oscar-winning actor went bright and colorful in a blue coat and a rainbow scarf as he met up with friends for dinner. Earlier that day, Jared took to Instagram to share a super hot video as he posed shirtless in his bathroom, baring his ripped abs! “thank you, next #dadbod @arianagrande @morbiusmovie 🧛‍♀️,” Jared captioned the video. Jared has been in London for the past few months filming the Spider-Man spinoff movie Morbius. Sam Asghari, Britney Spears‘ boyfriend, is speaking out about how she’s doing amid her treatment at a mental health facility. “She’s doing great. Thank you for your concern,” Sam responded when asked by TMZ today. He then seemed to refer to some fans who believe Britney may be held against her will. “Nobody needs to worry. She’s doing amazing,” Sam added, before saying she’ll be back soon. If you missed it, be sure to take a look at the newly acquired photos of Britney out for the first time since entering the facility.